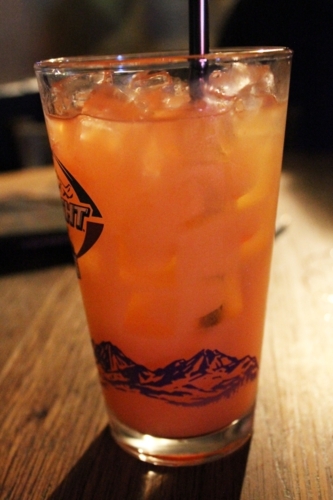 Bobbi’s Rum Punch is silver rum with orange and pineapple juices and a floater of Bacardi 151 and grenadine. Well, it is supposed to have a floater, but based on the lack of layers and its singular color, I’d say all those ingredients are just mixed together. It would be prettier it they were floaters instead, but this is still a strong, tasty rum drink. In fact, I would say it’s at the perfect saturation point for rum in a cocktail. It’s potent, but that fruit flavor is strapping enough to resist overwhelming the taste buds. I would love some lime with this drink, but otherwise, all it as it should be when you think of a tropical cooler that’ll knock you out in two.